Yesterday I received what might just be my last letter from DUO. At least on the topic of inburgeringsverplicht (the civic integration requirement). We (previously) sent you a letter. At the time we said that you had civic integration requirements. This letter informs you about the (current) status of your civic integration requirements. You have received a complete exemption from your civic integration requirements. Why have you received this exemption? You have successfully obtained a Dutch language diploma. This diploma shows that you have done enough on your civic integration requirements. Therefore you are not required to do the civic integration examination. Woohoo! Yesterday I logged into the DUO website to see if the results were there yet… and they were! Long story short, I passed everything. To pass each section you need 500 points or more. If you pass all four at the same time you get a diploma, otherwise you get a certificate for each section. Once you have all four certificates you can mail them back to get a full diploma. The previous post that I wrote with information about what it was like to do NT2 programma II can be found at this blog post. As some of you remember, last month I took the Staatsexamen Programma II to test my aptitude for the Dutch language. We were told that we would be able to access the results online after about 5 weeks, and receive a letter in the mail after 6 weeks. It’s getting closer to 5 weeks now, so I have started to check the website. I did this yesterday morning, but did not see anything. No problem – it’s not been five weeks yet. It turns out that it was yet another form letter (I get one every six months) telling me that they had no evidence on record that I had completed my requirements for my inburgeringsverplicht, i.e. requirements to stay in the Netherlands. (For the record, the requirement I need to complete is to pass the test that I am currently waiting on results from.) Irony! Please note this post will be in Dutch. For my English-only readers, it basically talks about my experience taking a Dutch language test issued by the government with four sections: writing, speaking, reading and listening. Successfully passing each section (either together or separately if a part needs to be re-taken) fulfills a requirement for Dutch residency that must be done within 3 years. I’m pretty sure I passed every section the first time around, but I won’t know for about 5 weeks. Op woensdag en donderdag heb ik het Staatsexamen: Nederlands als Tweede Taal, programma II gedaan. Het doel van programma II is om te laten zien dat je op een hbo/universiteit niveau kunt werken of studeren. Programma II is B2 niveau (zie ook Gemeenschappelijk Europees referentiekader). Ik heb het examen vooral voor het plezier gedaan maar het is ook goed voor mijn inburgering. Binnen drie jaar moet je een taalexamen doen. 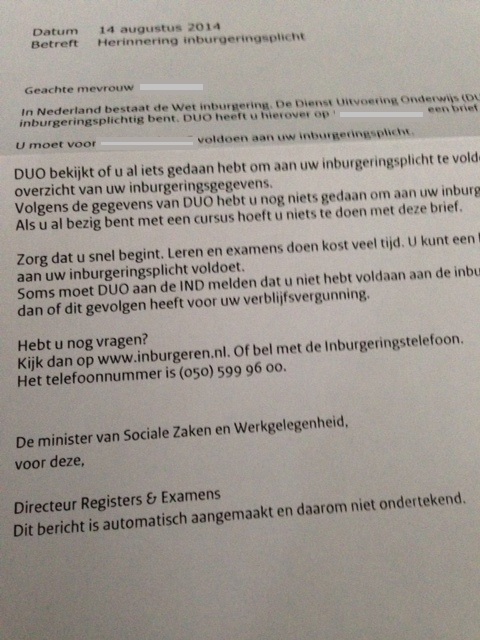 Het laagste examen is het inburgeringsexamen (A2). Dan heb je NT2 programma I (B1) en NT2 programma II (B2). Je moet één van de toetsen doen. Als ik voor NT2 geslaagd ben (alle vier delen), dan hoef ik geen toetsen meer te doen. Ik heb mijn examen bij de Rijswijk examenlocatie gedaan (vlakbij Den Haag). Dus misschien is sommige dingen anders voor je. 1. Ze leggen ALLES uit. Punt voor punt – ze geven je veel informatie over wat mag en wat mag niet, wat je bij het examen moet doen, hoe de computer werkt, enz. Je kunt ook het meeste van de informatie op cve.nl vinden voordat je het examen doen. As some of my readers know, I am halfway through the Staatsexamen. I had two of the parts today (writing and speaking) and have the other two sections (reading and listening) tomorrow. The goal I am hoping for is to pass all four the first time around so I do not have to repeat any sections. We will see how that goes. I will write up more of a report on how it went either Friday or this weekend, but for now I figured some of my family and friends would want to know how the first parts went: good, no trouble with writing. Speaking I had a little trouble but nothing too bad. I can’t say for sure that I passed – but I would be somewhat surprised if I didn’t. I mostly had trouble with the last two longer questions, where you are required to speak for up to two minutes each. More later in the week! It’s about time for me to take the Staatsexamen (programma II) and I can’t lie and say I am not nervous. But eh, het komt goed (it’ll turn out alright). The central library for The Hague had three practice exams (2012, 2009, and 2003-04) which I have done fully. There are also two additional tests on the official website (cve.nl) though I am pretty sure there’s a mistake with the 2002-03 test for the speaking part as the audio files and the test don’t seem to be from the same test. At this point I am focusing more on speaking and writing as those tend to be the harder sections. Writing is mainly to improve; I don’t really have a fear of not passing that one unless something monumental happens. Speaking should be alright, but there’s always the chance of suddenly forgetting how to speak! Poor Marco – I’ve been bugging him to help me with checking my speaking and writing, and taking criticism in those areas is not my strong suit. But it is not much longer now, and then I will be able to move on with other Dutch activities. 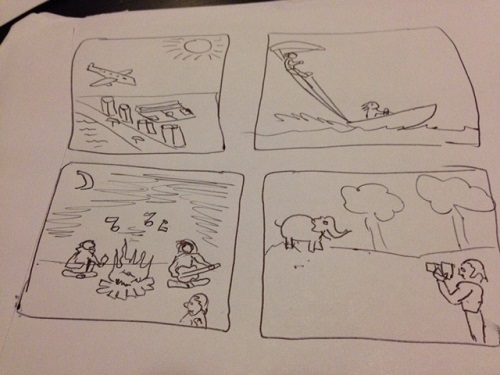 As I mentioned, next week is the exams for my B2 course at Mondriaan. Reading and writing on Tuesday and speaking and listening on Thursday. For that one you only need to pass three of the four sections to move on. In this case “moving on” is only useful if you want to take the NT2 Staatsexamen Training course that Mondriaan offers. Mondriaan does not offer anything beyond this (no C1+ courses), although other schools do. But after the B2 course is done, I will need to study for the actual NT2 Staatsexamen Programma II. For that one you need to pass all four sections (though not at the same time – you can re-do individual sections if you don’t pass one). 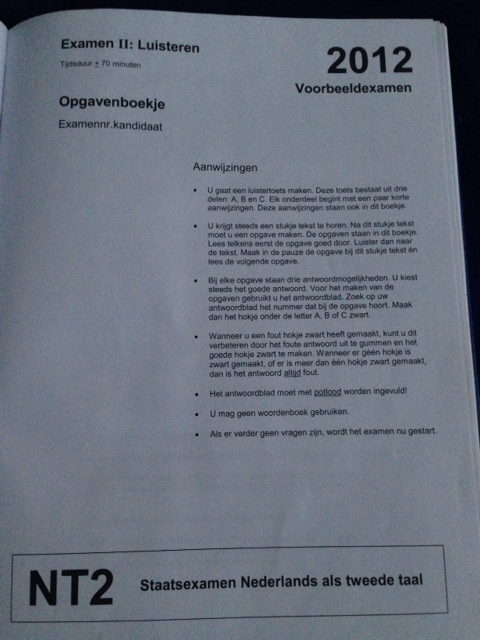 Thus I have checked out a voorbeeldexamen (practice exam) from The Hague’s central library – this one is from 2012. Above is a copy of the practice exam. 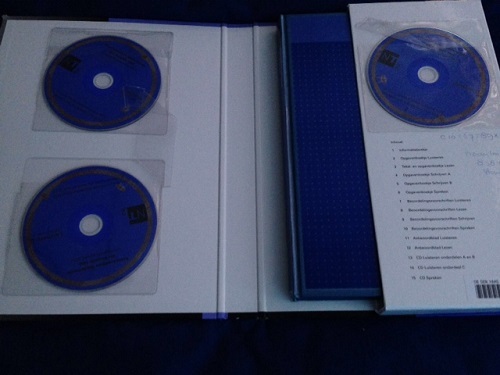 It contains four things – two CDs for listening (parts A/B and C) and one CD for speaking. It also contains a booklet with the four exams, the answers, and useful introductory information about each section (more than what is just given in the next picture). Example of the page before the listening section. As you can see (if you read Dutch), the length of the test is above 70 minutes. You also read that you cannot use a dictionary (there is no time, really), you must use a pencil, and if you need to erase an answer and choose another you must make it clear which one you meant. Also, a somewhat interesting requirement: during the pause after you hear the question you must answer it and read the following question and the possible answers. On the plus side, each piece you listen to has exactly one corresponding question – never more than that. Above is an example of a speaking question – this one is a bit longer. You receive 15 seconds to prepare (by looking at the pictures) and you have 30 seconds to speak. The good thing about the speaking exam is that you see most of the information in front of you. The only exception to this is sometimes you hear supplementary information. For example, if you need to give someone advice, you might hear them speak for a sentence about the problem and then hear them ask for advice, and the book says only luisteer naar uw vriend en reageer – listen to your friend and respond. Don’t worry though – they have already mentioned what the problem is above, in writing. They are not testing your listening skills here! 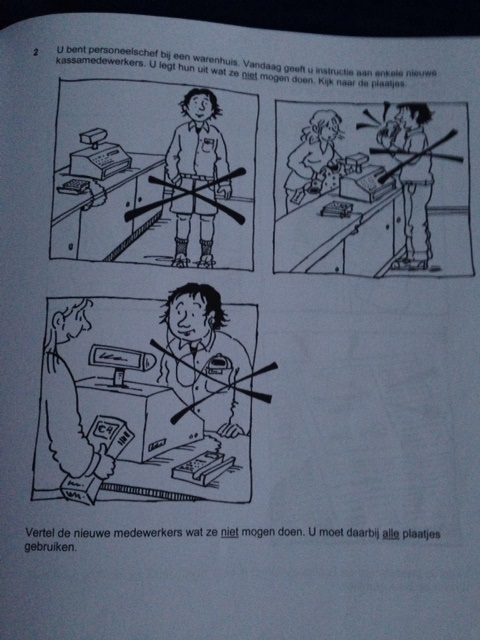 This question says that you work for a company and today you have to give instructions to the new cashiers about what they must not do, and that you have to use all of the images in your answer. So you could say something like: U mag geen korte broek dragen, u mag bij de kassa niet eten en u mag tijdens uw werk niet naar muziek luisteren. You cannot wear shorts, you cannot eat by the cash register, and you cannot listen to music while you werk.